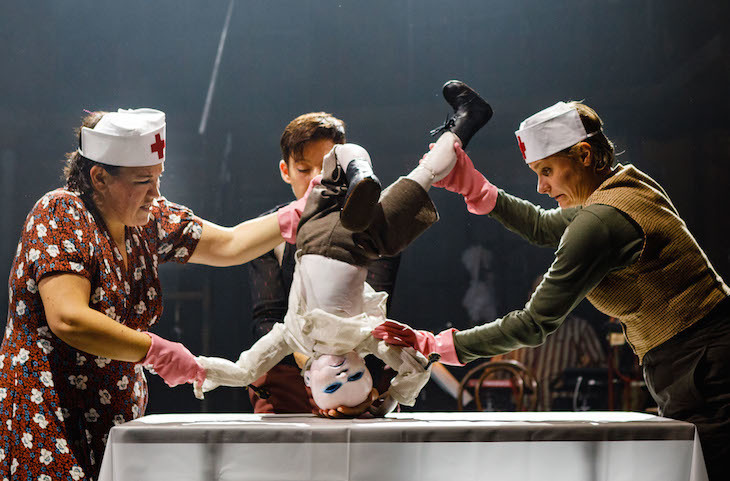 This is the ultimate ‘Marmite’ show — anyone who’s read the 1959 Günter Grass novel or seen the 1979 film will be thrilled by this enthusiastic and explosive production, as will devotees of Kneehigh’s deconstructive and occasionally anarchic style of ‘immediate’ theatre in a near perfect setting. For anyone else, your heart may sink at the sight of (yet another) manipulated child puppet, albeit one who sings with longing for his own amniotic sac, and gets his umbilicus cut on stage — as the embodiment of Oskar, the illegitimate child who ‘decides’ at age 3 never to get any older. 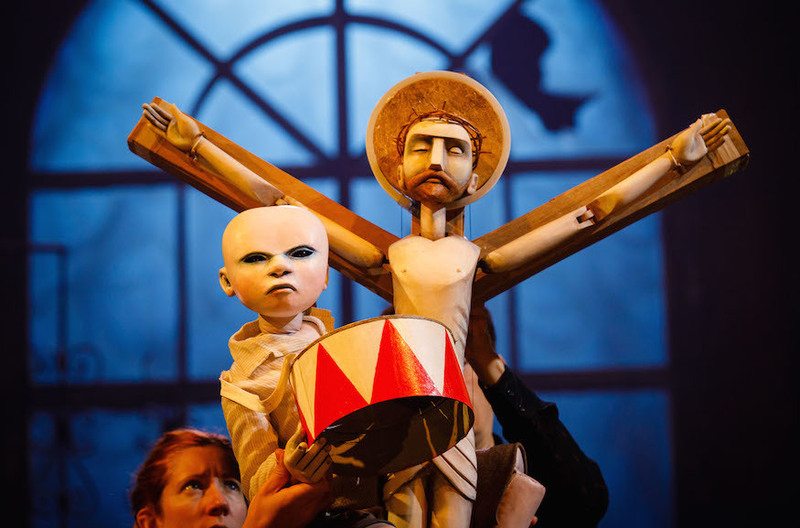 Kneehigh presents The Tin Drum by Carl Grose, directed by Mike Shepherd ©Steve Tanner. The Tin Drum is his manipulated view of the hypocritical unjust world, seen in a longish first act mostly through the eyes of the puppet child, and in the more chaotically eventful second as his processional journey to a mental hospital. 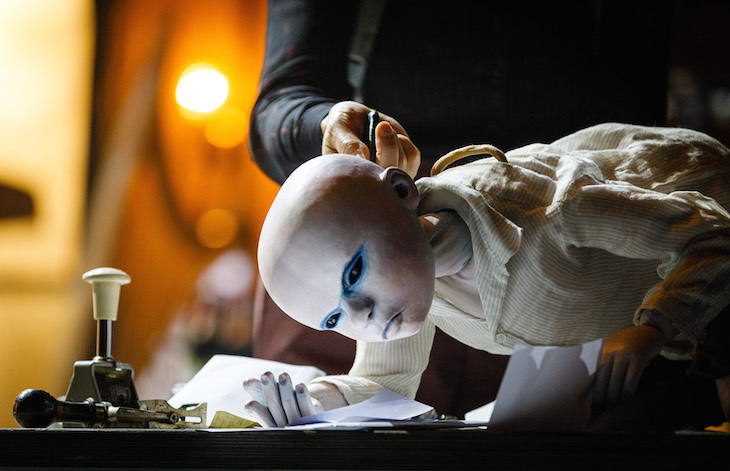 There is no doubt that in terms of performance, music, theatrical effects and plenty to look at, Kneehigh has done a wonderful job to elevate this difficult and complex novel to the stage. The coach party of a Year 11 German class behind us absolutely lapped it up and were agog with chatter at the interval. If mid-century European magical realism with a sardonic side order of the rise of Nazism is your thing, you will derive much pleasure from the show. If you’re unfamiliar with the genre — it could be a long night, although a long night of stomping choreography, dramatic events, window-shattering singing and, inspired by the tin drum itself, Charles Hazelwood’s fantastic panoptic musical score with authentic echoes of rock, Weimar cabaret, opera, kletzmer, waltz and troubadour ballad. The Tin Drum, Shoreditch Town Hall, 380 Old Street EC1V 9LT - until 23 December 2017. £12-25. Age guidance: 14+.